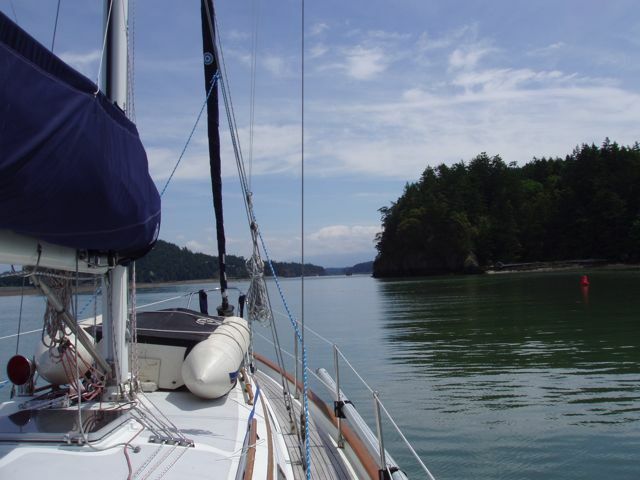 The Swinomish Channel is narrow and SHALLOW! We had, at most, 8 feet under us. For a six-foot draft, that's cutting it closely. The channel is named for the local First People and leads from Skagit Bay (Puget Sound, actually) into LaConner and then out to Padilla Bay. 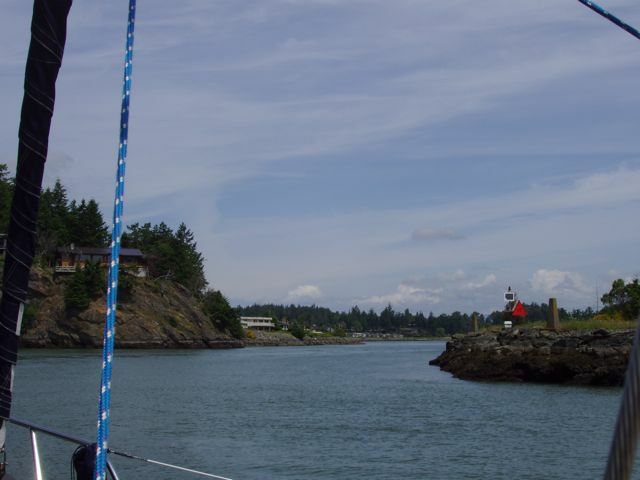 Because it offers an alternative to going through the very narrow Deception Pass with all its tidal rips, it's known as the "Chicken Route" to the San Juan Islands. Swinomish Channel at its narrowest travels through an "S" curve but has gained a bit of much-needed depth. An aid to navigation is on the starboard bank: "red on right on return." Seattle! We made it! 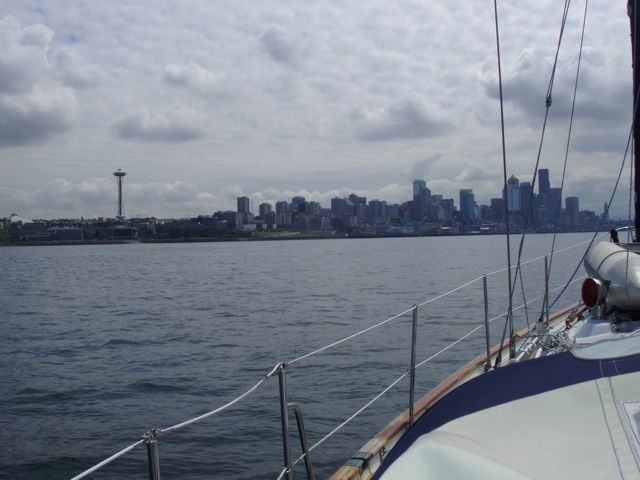 The iconic Space Needle is at left. 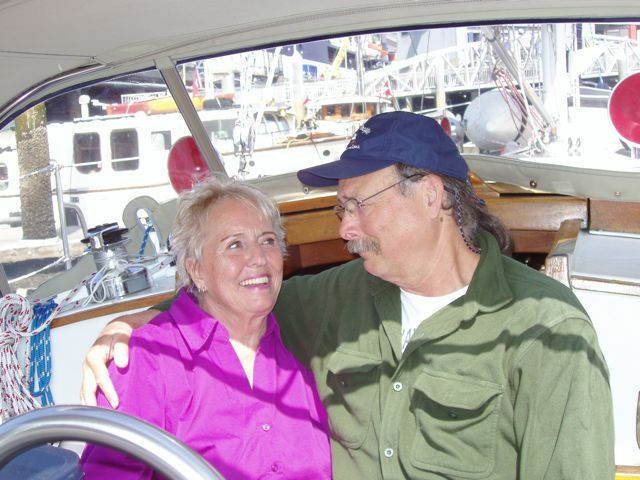 Conni took us for a tour of the waterfront before making it to our harbor. We traveled very close to the Space Needle. 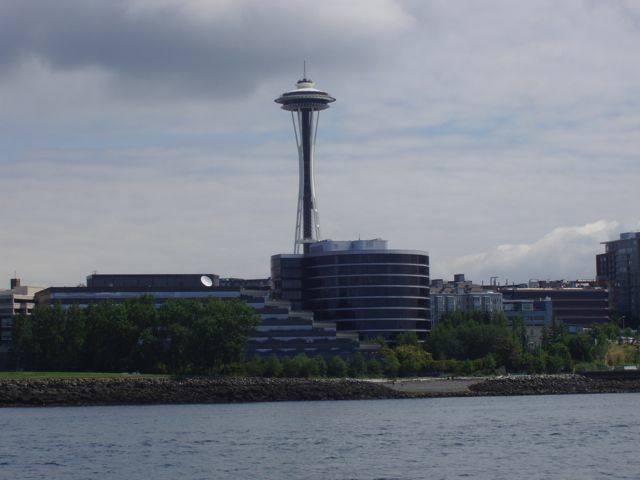 The 605-foot tall Space Needle was completed in December 1961 and officially opened a mere four months later on the first day of the Seattle World's Fair, April 21, 1962. Its construction included many "firsts" and was a designing and construction tour-de-force. An underground foundation was poured into a hole 30 feet deep and 120 feet across. It took 467 cement trucks an entire day to fill the hole, the largest continuous concrete pour ever attempted in the West. Once completed, the foundation weighed as much as the Space Needle itself, establishing the center of gravity just above ground. As long as the structure remains intact, it cannot topple. 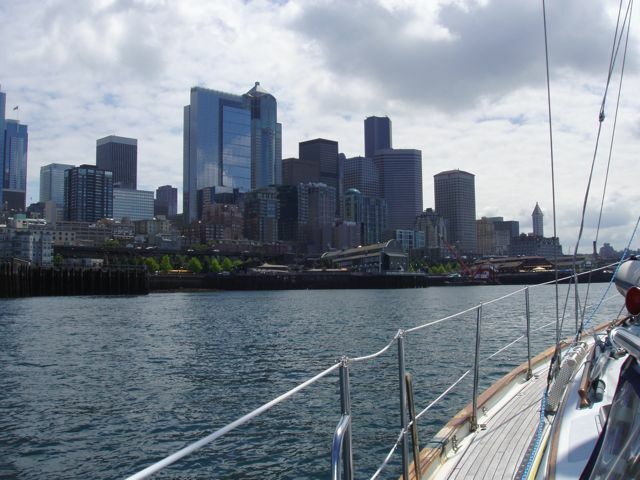 Downtown Seattle from the deck of Wings as we cruise Elliott Bay. 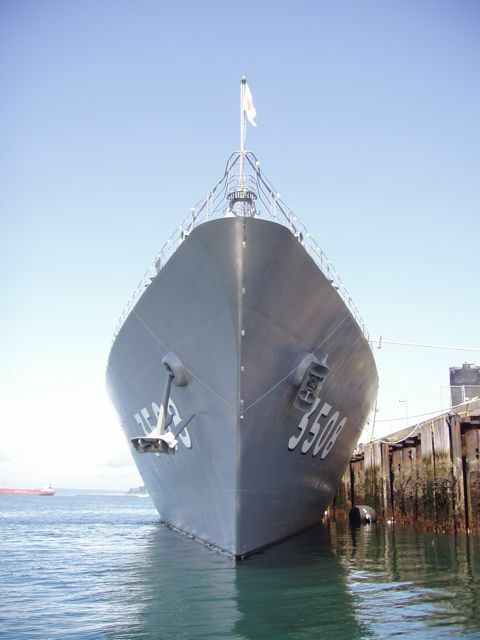 The 460-ft Japanese training vessel Kashima was docked just outside the entrance to Bell Harbor in downtown Seattle. She was there to host a gala evening with the Japanese American community of Seattle. 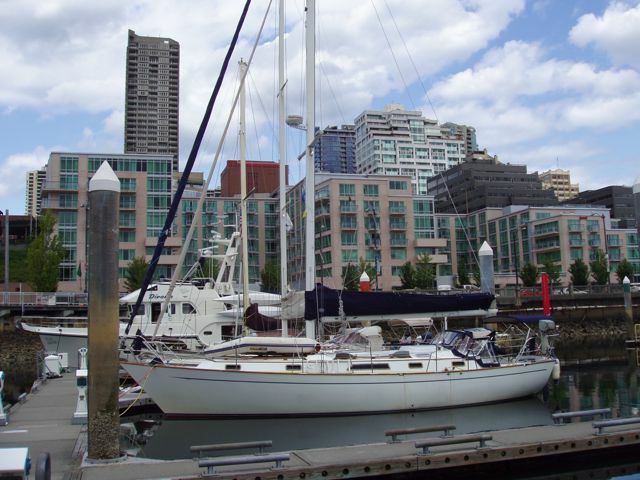 Wings in her Seattle berth: A8 in the Bell Harbor Marina. At $1.25 per foot per day and $5 for power, it was not the most expensive harbor in which we've stayed (that would be Victoria), but certainly one of the most spectacular. 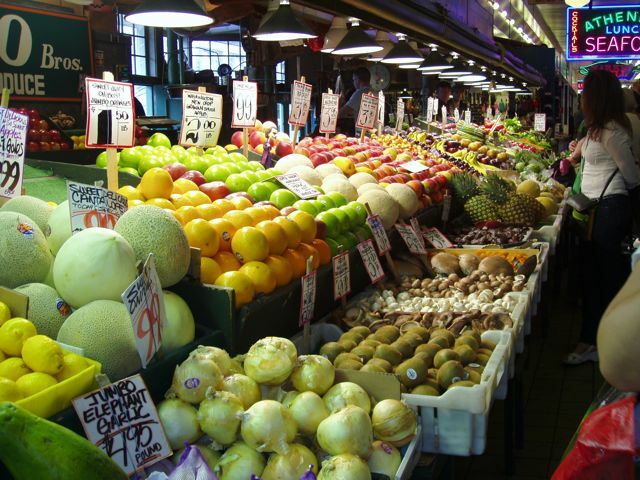 Veggies for sale in Pike Street Market. I love the colors! 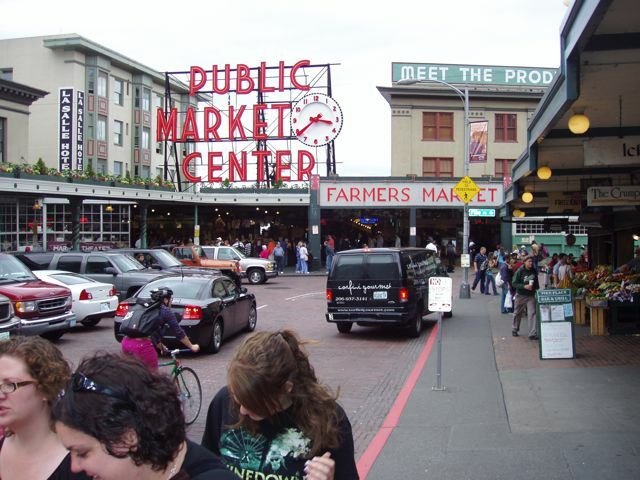 Another Seattle icon: the sign for the Pike Street Market. 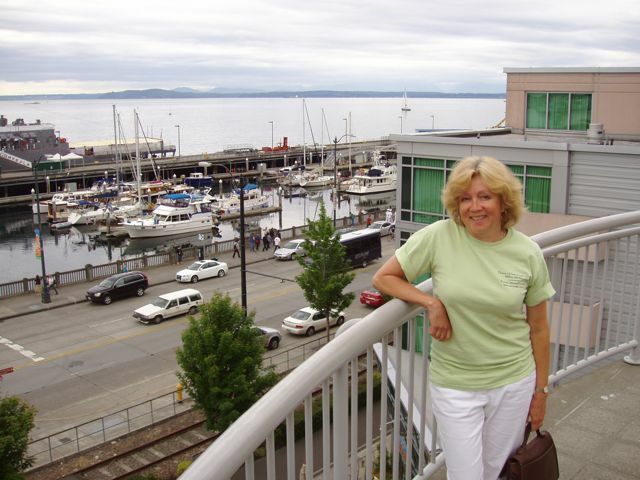 Lovely Conni walking up to the Pike Street Market from our harbor. Kashima's stern, prepared for the party, is behind her. Wings is the tallest-masted sailboat in center frame. Two of the several classic wooden yachts that arrived for the annual Classic Yacht Show. 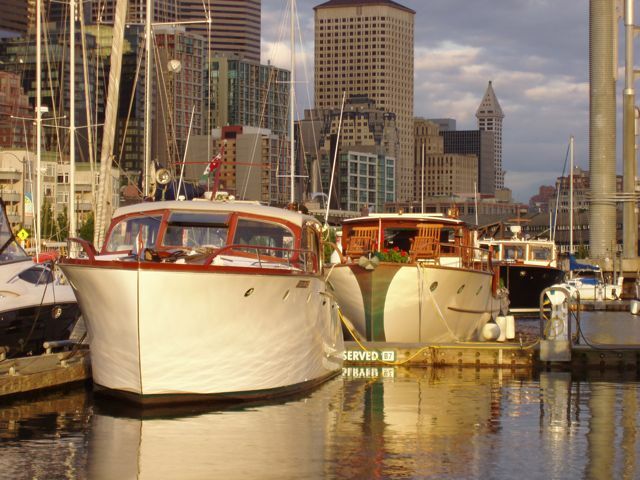 These are all one-off wooden yachts that have had exceptional care and maintenance. The Kashima party in full swing. 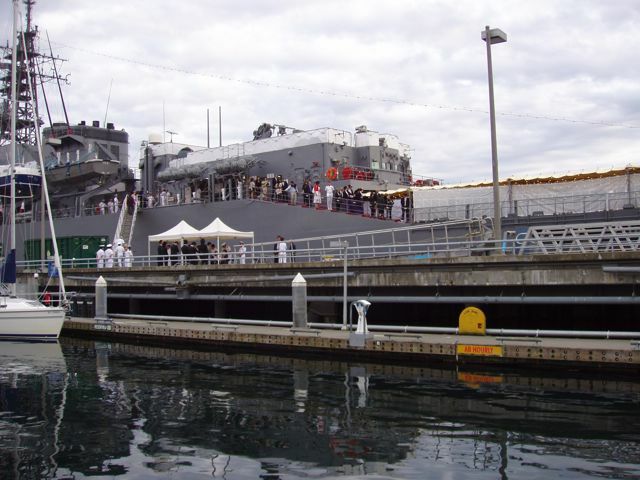 On leaving, we saw two American Navy admirals and lots of captains: quite a regal crowd. Carol Stephens, my old friend, has changed little. It was great to see her. She visited with us on the boat before we had to leave Seattle. Not a cloud! This is Mt. 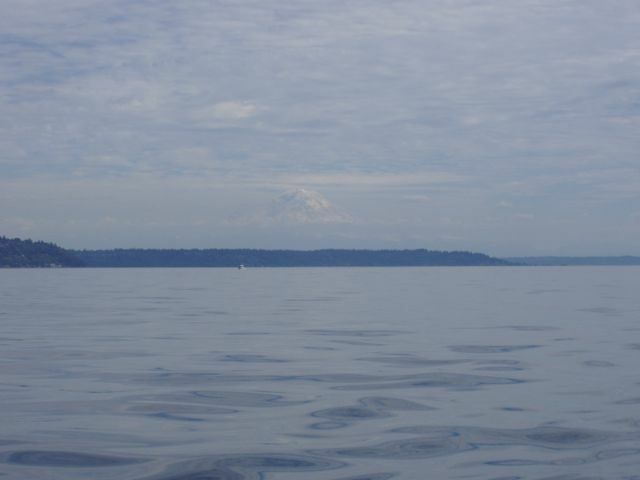 Ranier! 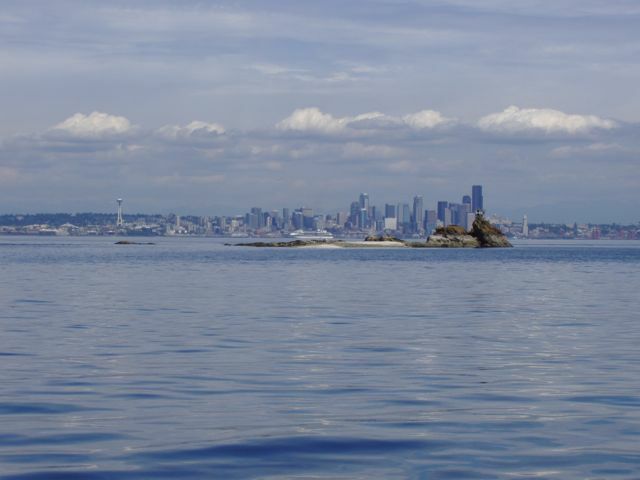 Seattle, the Emerald City, from behind a marked rock hazard near Bainbridge Island.